Jean Claude Dresse, console, resin and steel, Belgium, 1970s Wonderful resin console table is a design by the hand of Belgian designer Jean Claude Dresse. This console is made out of a resin table top, resting on lacquered metal feet. The rectangular shaped table top is finished with an organic pattern. This hall table is unique due to the lines in resin that are drawn by hand. A piece that finds itself between the borders of furniture design and art. The table is in good condition. Jean Claude Dresse (1946-) is a Belgian artist and designer. He graduated from the art academy in Charleroi. His background of being a visual artist is clearly visible in his furniture designs as he uses artistic techniques such as mosaic and etchings. He makes use of precious metals such as brass and copper. Together with his father he was a prominent figure in the furniture business in the 1980s and he belongs to the artistic Walloon school that focused on glamorous esthetics. The console table is in good condition and shows few signs of age and use. 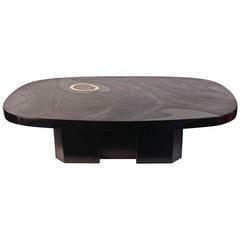 Jean-Claude Dresse black resin agate coffee table, circa 1970, signed by the artist. A unique, custom Royère console table by Jean Royère. Documented. Important emerald green fractal resin top rectangular console top resting on chromium plated square plinths. Attributed to Marie-Claude Fouquieres.